Just this week, Baltimore’s WJZ-TV channel 13 did a wonderful story on the recovery efforts that the Oyster Reef Recovery Initiative, the Marylander’s Grow Oysters Program, and the Oyster Recovery Partnership are working towards. EASTON, Md. (WJZ) — It’s a shell game with an awful lot riding on it: restore enough oysters and improve the Chesapeake Bay’s waters. 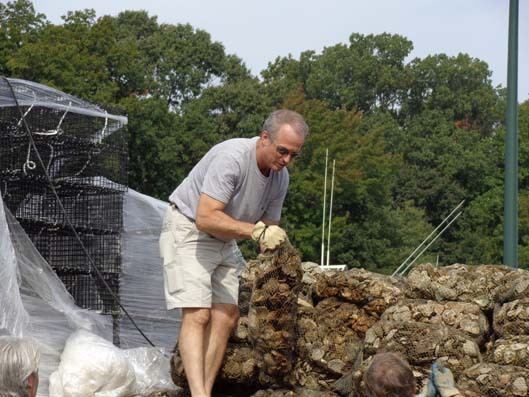 About $300 million is being spent to rebuild healthy oyster reefs in Maryland waters. Old shells carrying baby oysters raised in a state lab are scattered into protected sanctuaries. “We’re almost to a billion oysters and that’s a record-breaking year for us,” said Heather Epkins, Oyster Recovery Partnership. But far smaller efforts are also gaining momentum. Marylanders are growing them off their docks.